VBA Find Range in Excel will help you while automating a task to find a cell with specific string or value in a range. You can specify the different options while looking for a string. It can be exact match, search direction, search after, etc. Here is the syntax to find a string or value in a range. 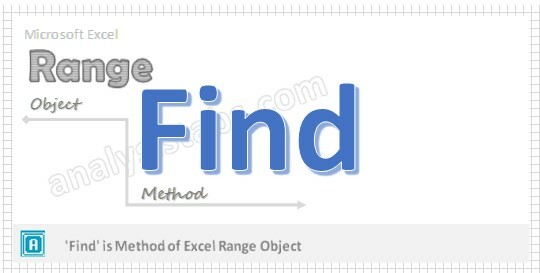 Find method will return the range of the matched cell. What: String or a value to be searched. After – (Optional): You can mention the search start cell, By defaults it will be the first cell in the given range. LookIn – (Optional):The information which you want look in the given range. It can be xlValues, xlFormulas and xlComments. SearchOrder – (Optional): We can tell how to search weather it is by rows or by columns by using xlByRows and xlByColumns. SearchDirection – (Optional): You can mention the search direction – next or preivious by using xlNext and xlPrevious. MatchCase – (Optional): You can specify if your search is case sensitive: True = Case Sensitive. SearchFormat – (Optional): You can specify the Search format. Below is the Excel VBA Macro to find a string in specific range and return the matched range address. This macro will search for the string “ab” from the first cell of the given range and returns matched range address. Below is the Excel VBA Macro to find a string in specific range and return the matched range address. The start cell must be in the specified range. This macro will search for the string “ab” from “B3” and returns matched range address. Below is the Excel VBA Macro to find a string in specific range and return the matched range address. The start cell must be in the specified range. When we write MatchCase:=True that means find string is case sensitive. This macro will search for the string “ab” from “B3” and returns matched range address. As we mentioned MatchCase:=True, it will look for exact match only. Enter some data in any cells in range “B2:D10″ to test this macro. Now, it will the search for the exact match string “ab” from “B3” and returns matched range address.